One Sunday Afternoon - Creativity Coaching: An e-Interview with Jill Badonsky! An e-Interview with Jill Badonsky! 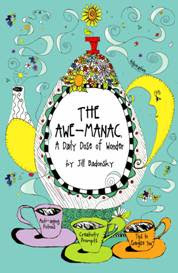 Jill Badonsky is on a blog tour to promote her new book The Awe-manac: A Daily Dose of Wonder, which provides daily writing and art prompts, journal writing starters, whimsical illustrations and humor on every page, as well as quotations in the guise of soul vitamins. She has graciously accepted to submit herself to a litany of questions from various blogging community denizens, myself included. Okay... Jill here we go with the interview questions... and thanks, by the way, for sharing snippets of your book with me (and by extension, my readers) this week. A: I am a great fan of the Farmers' Almanac, with it's natural world tidbits... is this where you got your inspiration for your newly released book, The Awe-Manac: A Daily Dose of Wonder? J: The Awe-manac inspiration came from a multi-faceted intersection of inspirations, loose associations, occasional tangents, odd recollections, yielding eurekas and brain detours. And the Farmer's Almanac. One of my favorite tricks is to find something that already exists and twist, tweak and tease it a bit so that I can use it for something different-most often something inspiring and hopefully irreverent. My collection of quirky writing prompts, quotes, daily observations, metaphors of gardening, illustrations, potions, astrology and tides all fit nicely into an almanac format. A: We creative types are a pretty unruly lot (well... I speak for myself, mostly), my creative direction largely helmed by innate creative urges. Do you think that The Awe-Manac might be a useful tool in honing a person's creative process, regardless of the media that they create in? J: Good question. Yes I think it's useful mainly for these reasons 1). The prompts encourage us to look beyond the obvious and associate ideas and 2). It's daily so it's like being fed inspiration regularly in small doses and I find that that works for the clients I work with. 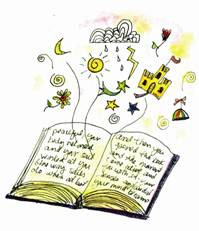 The prompts encourage readers to go beyond writing – to dance, collage, paint, doodle, write music. I read someone's blog who is using it to inspire her needlepoint art. A: This is your second book (the first was one of my favorite reads: The Nine Modern-Day Muses (and a Body Guard): 10 Guides to Creative Inspiration for Artists, Poets, Lovers, and Other Mortals Wanting to Live a Dazzling Existence). What inspires you to write them and what advice to you have for the would-be writer who is high on the inspiration scale, but low on the how-to-birth-a-book scale? J: Thank you! I'm not sure what inspires me to write other than I feel I have to. I believe we have what we are supposed to do with our creative urges programmed in our DNA and when we can clearly hear and follow our call, we are following our bliss. I like to align with my bliss. When I write it's one of the few times I feel I'm doing what I'm supposed to do. Highly inspired, low book-birthing writers usually do best with some structure or at least a deadline. Take classes (but be wary of finding the right teacher for you). Get a creativity coach, work with a friend but keep writing. Blogging has become a great way to generate content that you can eventually put into a book. If you procrastinate, break it down: write for 5 minutes a day, ask small questions, lower your expectations at the beginning and just keep doing it. A: Would you mind sharing what a typical day-in-the-life-of-Jill-Badonsky looks like, from hitting the snooze button on the alarm clock to clicking off the lights with your head on your pillow? J: It's really nothing special although I do talk to myself a lot – sometimes with an English accent. I get to work for myself so the discipline is challenging. On good days, I usually get up around 7, do a little morning ritual designed to keep the child-like part of my spirit happy, work-out and spend the rest of the day writing, answering emails and inventing things. In the evening I usually laugh a lot with my boyfriend, Randy and watch The Daily Show. On the bad days, I nap a lot with the cats. We creative people have cycles like that. A: Your writing is inspiring... your artwork is enchanting... what are your "what's next" plans? J: Thank you again. I'm planning on making product spin-offs from The Modern Day Muse book and The Awe-manac. I have a few book ideas up my sleeve as well. One from my creativity and wellness coaching club, Body Blissmas and a Happy New Rear and the other one is another quirky book with lots of illustrations and things to laugh about. Thanks for the great questions Adriane. They were fun. I love your blog.